Place the quinoa in a medium saucepan with 2 cups water and bring to the boil. Reduce the heat and allow to simmer for 12 minutes, then turn off the heat and allow to cool. Cook broccoli in a saucepan of boiling water until just tender. Drain. Refresh under cold running water. Drain, and coarsely chop. Whisk eggs and flour in a large bowl until smooth. Add quinoa, broccoli, salmon, parsley and lemon zest. Season the mixture with cracked pepper and stir until well combined. Spray a large, non-stick frying pan with olive oil and set over medium-high heat. Form medium sized patties with your hands, and cook patties for 2-3 minutes each side, or until golden and cooked through. Repeat with remaining batter. Combine, spinach, cucumber, cherry tomatoes, feta and balsamic glaze in a salad bowl. 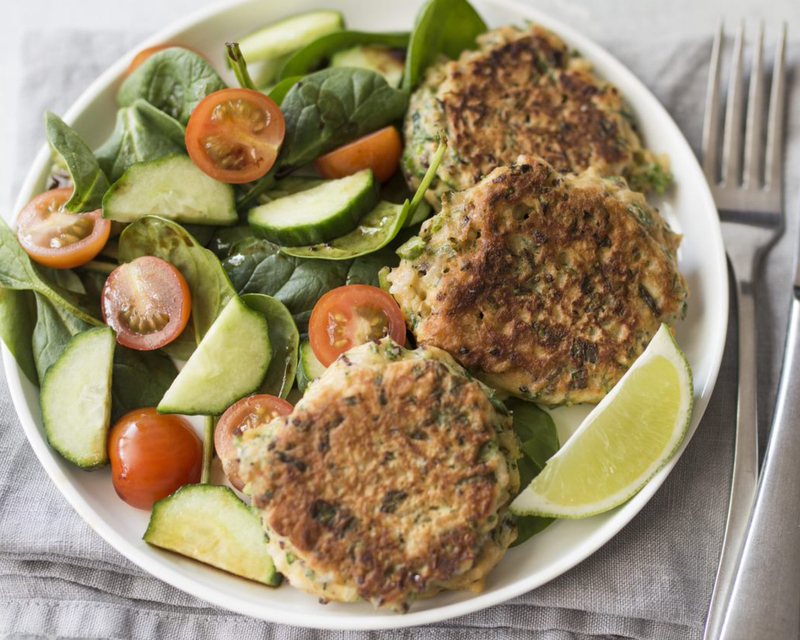 Serve patties with salad. Optional extras include lime wedge, freshly chopped chilli or Greek-style yoghurt.